"Maiden Voyage" is a jazz composition by Herbie Hancock from his 1965 album Maiden Voyage. It features Hancock's quartet – trumpeter Freddie Hubbard, bassist Ron Carter and drummer Tony Williams – with additional saxophonist George Coleman. It is one of Hancock's best-known compositions and has become a jazz standard. The piece was used in a Fabergé commercial and was originally listed on the album's master tape as "TV Jingle" until Hancock's sister came up with the new name. In the liner notes for the Maiden Voyage album, Hancock states that the composition was an attempt to capture "the splendor of a sea-going vessel on its maiden voyage". While being interviewed for KCET TV in 2011, Hancock considered Maiden Voyage to be his favorite of all of the compositions he had written. Opening chord: minor eleventh chord (Am9/D). Rhythmic ostinato, a transformation of the bossa nova rhythm. The chord voicings used by Hancock make extensive use of perfect fourths. Jazz.com's Ted Gioia describes the harmonic progression used as, "four suspended chords,"  Jerry Coker describes the progression as "only sus. 4 chords," while The Real Book lists the chords as four minor seventh chords with the bass note a fifth below the root which matches Hancock's description of the opening chord (right). The Real Book also spells the fourth chord (mm.22-24) as A♭-7/D♭, while Owens spells it C♯mi13. 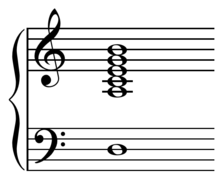 The pitches of C♯mi9 (ninth chord) are C♯ E G♯ B D♯ and the pitches of A♭-7/D♭ enharmonically, and C♯mi13 (thirteenth chord), are C♯ G♯ B D♯ F♯ (A♯). Hancock later reworked the track into the more electronically tinged "Maiden Voyage / P. Bop" on his 1988 album Perfect Machine. American rock band Toto covered the piece on their 2002 album Through the Looking Glass. American jam band Phish has been known to cover the piece in their live shows, and a recording of it appears on their live album Colorado '88. Robert Glasper performed a cover of "Maiden Voyage" interspersed into the Radiohead song "Everything In Its Right Place" on the album In My Element. Bobby Hutcherson performed a version with Hancock on his 1966 album Happenings. American rock/jazz band Blood, Sweat & Tears covered "Maiden Voyage" on their 1972 album New Blood. Joey Alexander performed a cover on his 2016 album "Countdown". ^ Herder, Ronald (1987). 1000 Keyboard Ideas, p.75. ISBN 978-0-943748-48-1. ^ Coker, Jerry (1997). Jerry Coker's complete method for improvisation: for all instruments, p.64. ISBN 978-0-7692-1856-4. ^ Carr, Ian; Fairweather, Digby; Priestley, Brian (2004). The Rough Guide to Jazz. Rough Guides. p. 332. ISBN 1-84353-256-5. ^ Rosenthal, David H. (1993). Hard Bop: Jazz and black music 1955–1965. Oxford University Press US. p. 68. ISBN 0-19-508556-6. ^ a b c Kernfeld, Barry (1997). What to Listen for in Jazz, p.68. ISBN 978-0-300-07259-4. ^ Kernfeld, Barry (1997). What to Listen For in Jazz, p.23. ISBN 9780300072594. ^ Kernfeld, Barry Dean (1995). The Blackwell Guide to Recorded Jazz. Wiley-Blackwell. p. 388. ISBN 0-631-19552-1. ^ Gioia, Ted (18 December 2007). "Herbie Hancock: Maiden Voyage". Jazz.com. Retrieved 30 August 2010. ^ Coker, Jerry (1984). Jazz Keyboard for Pianists and Non-Pianists, p.46. ISBN 0-7692-3323-6. ^ a b The Real Book, Volume I. Hal Leonard corporation. 2004. p. 261. ISBN 0-634-06038-4. ^ Owens, Thomas (1996). Bebop: The Music and Its Players, p.164. ISBN 9780195106510.